Product prices and availability are accurate as of 2019-04-11 03:11:59 EDT and are subject to change. Any price and availability information displayed on http://www.amazon.com/ at the time of purchase will apply to the purchase of this product. 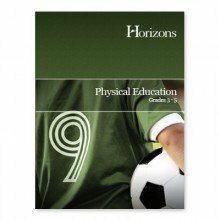 Horizon's multidimensional Physical Education Curriculum looks to goals beyond that of pure physical fitness. Physical Education helps children to learn how to use the body as an instrument for God, a goal which acts as the end for other objectives such as psychomotor skills, motor proficiency, expressive movement, knowledge, understanding the human body and decisions. The first lesson includes notes for using the curriculum, including physical education, goals, curriculum model, plans, administration notes and other teaching helps, all of which are given from a Christian perspective. An entire chapter for Christian schools is included with reproducible forms and information on working with children with disabilities. Each grade's chapter includes information on developing, creating, and producing control skills, motor abilities and specialized sport skills, and contains notes on helping students to build strength and flexibility. Exercises, games, songs, and various other activities are described and some illustrated; many include ideas for which two or multiple children will be necessary. Integrating actual physical activities with teaching that accompanies it-on the body, various related skills (balance and miming), Scripture-related lessons, communication skills, defined new sports terms, and other non-active content, make for a complete, integrated curriculum. 573 pages, softcover. Grades 3-5.